Has your holiday menu taken on a slightly redundant tinge? Each year it’s the same old same old. Roasted meats, steamed sides and pie for dessert. It’s not the flavors that are boring, it’s the presentation. So change it up just tiny bit. Instead of using the traditional top crust or lattice crust for a fruit pie, cut season-appropriate shapes into the crust top your pie that way. We can also change out the traditional pie fillings—apple, cherry and berry pies—for a slightly less popular, but no less flavorful filling. 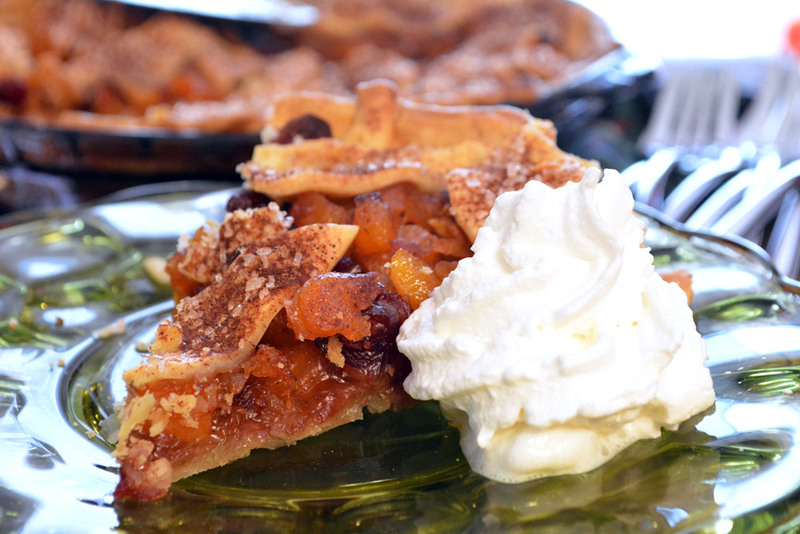 Cranberries and apricots have a delightful tang that fruit pie lovers adore. And using soaked dehydrated fruit gives this pie the perfect bite. Forego the lifeless and squishy canned apricots for their uniquely delicious dried brethren. Even after soaking and baking, dried apricots retain enough body to keep your guests asking for seconds. Balancing tartness and sweetness is also key. So many pie fillings are so disgustingly sweet or dripping with syrupy gel that more than two or three bites results in stomach upset. No host wants to see desserts left sitting on plates, and this pie won’t disappoint. With only a half cup of sugar added to the fruit filling, the cranberries and apricots still have a footing in the flavor of this pie. There’s also very little filling that isn’t fruit. The residual soaking liquid combined with the small amount of sugar isn’t going to make this pie soupy or soggy. As such, it has a slightly shorter baking time: about 50 minutes as opposed to 70, or more. Because it does have a top crust—even if it’s in pieces—and it’s baked at 375°F, we’ll want to cover the edges in foil to prevent over browning for the first 35 minutes. The last 15, the pie gets to bake in naked glory allowing the crust to brown beautifully. Our unusual top crust also gets a bit of a make over with a touch of pumpkin pie spice sprinkled on the crust leaves for added color and flavor. To top it all off, this pie can be served very warm from the oven. No long cooling times are required to allow the gel to set. It’s not necessary to reheat this pie for serving warm with a scoop of vanilla bean ice cream, or a generous dollop of whipped cream. If you want to try a new pie for the holidays, this one might be just the pie you add to your regular pie rotation. Prepare the pastry or unroll the pie crusts and set aside. Add the craisins and apricots to a large mixing bowl. Cover them with boiling water and let stand for 15 minutes. Preheat the oven to 375°F. Drain the liquid from the apricots and cranberries and return the fruit to the mixing bowl. Add the sugar, cornstarch, pie spice and salt to the fruit and stir to combine. Ease one crust into the bottom of a 9-inch pie plate. Fold any excess over and crimp to seal. Pour the fruit into the crust. Cut leaf shapes or other holiday shapes into the top crust. Arrange the shapes on top of the filling pressing some shapes to the edge of the crust. Brush the crusts and shapes with milk and sprinkle with the sugar sprinkles. Dust lightly with pumpkin pie spice. Place strips of aluminum foil around the edge of the pie to prevent the crust from over browning. Place the pie on a baking sheet and bake in the center of the oven for 35 minutes. Remove the foil and bake for an additional 15 minutes. Remove the pie from the oven and allow it to cool sufficiently before serving. Store covered at room temperature.